The Socket Bluetooth Cordless Hand Scanner (CHS) 7Ci brings low cost 1D wireless bar code scanning without sacrificing performance, making the CHS 7Ci an excellent general purpose data collection solution for the mobile workforce. Available in Grey, Yellow, Red and Blue Color. The Socket Bluetooth Cordless Hand Scanner (CHS) 7Di/7DiRx brings low cost 1D wireless bar code scanning without sacrificing performance, making the CHS 7Di/7DiRx an excellent general purpose data collection solution for the mobile workforce. The Socket CHS 7Pi is a durable, high-performance 1D laser barcode scanner certified by Apple for iOS devices. It is best-suited for moderate to intensive scanning applications and/or scanning in sensitive lighting conditions. The CHS 7Xi and 7XiRx brings the productivity benefits by adding robust barcode scanning to Apple iOS and the most common mobile devices and platforms today. By using advanced digital imaging technology, the CHS 7Xi and 7XiRx accurately and reliably captures all 2D and 1D barcodes in any orientation. Not only is the Colorful Series 7 easy on the eyes, it is also easy to use. Formed to fit comfortably in the hand and built lightweight for long hours on the job, this scanner is dressed to impress both consumers and end users in retail settings. But it is more than just the scanners’ looks that are striking. The Series 7 is also certified by Apple® for iOS devices and compatible with Android, and Windows devices, the Series 7 is adaptable with the most widely used operating systems to better ensure operating satisfaction. 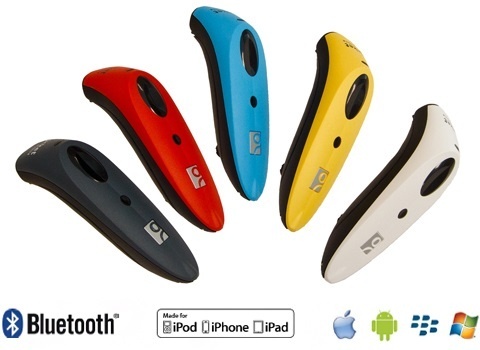 Socket Mobile Series 7 Antimicrobial Case, Apple Ios/Android, 2D Imager, Bluetooth V2.1, Hid, Spp. Comes With Lanyard/Belt Clip With Tether, Charger, Rechargeable Battery, And Cd With Documentation And Software. - Socket Mobile Series 7 Antimicrobial Case, Apple Ios/Android, 2D Imager, Bluetooth V2.1, Hid, Spp. Comes With Lanyard/Belt Clip With Tether, Charger, Rechargeable Battery, And Cd With Documentation And Software. Socket Mobile Series 7 Durable Case, Apple Ios/Android, 2D Imager, Bluetooth, Hid, Spp. Comes With Lanyard/Belt Clip With Tether, Charger, Rechargeable Battery, And Cd With Documentation And Software. - Socket Mobile Series 7 Durable Case, Apple Ios/Android, 2D Imager, Bluetooth, Hid, Spp. Comes With Lanyard/Belt Clip With Tether, Charger, Rechargeable Battery, And Cd With Documentation And Software. Socket Mobile Series 7 Cordless Hand Scanner (Bluetooth, 7X, 2D, Hid + Spp) - Package Of 20 Scanners. - Socket Mobile Series 7 Cordless Hand Scanner (Bluetooth, 7X, 2D, Hid + Spp) - Package Of 20 Scanners. Standard Lithium-Ion Battery Provides Excellent Battery Performance For Long-Lasting Scanning Performance And And Standby Time. - Standard Lithium-Ion Battery Provides Excellent Battery Performance For Long-Lasting Scanning Performance And And Standby Time. Select Product * Please select product Acc, Charging Cradle With Latch & Ac Adapter For 7p/7x/7xi Acc, Charging Cradle With Latch & Ac Adapter For 7xrx/7xirx Bluetooth Cordless Hand Scanner (20-Pack, 2D, Hid, Antimicrobial) Charging Cradle For The 7C/7E/7M Cordless Hand Scanners Socket Mobile Series 7 Antimicrobial Case, Apple Ios/Android, 2D Imager, Bluetooth V2.1, Hid, Spp. Comes With Lanyard/Belt Clip With Tether, Charger, Rechargeable Battery, And Cd With Documentation And Software. Socket Mobile Series 7 Antimicrobial Cordless 2D Hand Scanner, Omnidirectional Imager, Durable Case, Multiple Platform Support (Apple Ios, Android, Blackberry, Windows), Bluetooth V2.1 + Edr Interface. (20 Bulk) Socket Mobile Series 7 Bluetooth Chs 7E V3, C1 Lsr, Bluetooth V2.1, Hid, 2Pp - 20 Bulk Socket Mobile Series 7 Bluetooth Chs 7Nrx V3, C1 Lsr Hid, Spp, Vibrate, Antimicrobial Socket Mobile Series 7 Bluetooth Chs 7Nrx, Hid, Spp Vibrate, Antimicrobial, 20 Bulk Socket Mobile Series 7 Cordless 2D Hand Scanner, Omnidirectional Imager, Durable Case, Multiple Platform Support (Apple Ios, Android, Blackberry, Windows), Bluetooth V2.1 + Edr Interface. (20 Bulk) Socket Mobile Series 7 Cordless Hand Scanner (1D Linear Imager, Bluetooth V2.1, Hid, Spp) Socket Mobile Series 7 Cordless Hand Scanner (20-Pack, Bluetooth, Chs 7M V3, C2 Laser, V2.1, Hid, Spp, Vibrate) Socket Mobile Series 7 Cordless Hand Scanner (7Xrx, Spp, Antimicrobial) Socket Mobile Series 7 Cordless Hand Scanner (Bluetooth, 7X, 2D, Hid + Spp) - Package Of 20 Scanners. Socket Mobile Series 7 Cordless Hand Scanner (Bluetooth, 7X, 2D, Hid + Spp) - Package Of 20 Scanners. Socket Mobile Series 7 Cordless Hand Scanner (Bluetooth, 7X, 2D, Spp) Socket Mobile Series 7 Cordless Hand Scanner (Chs 7M2, Bluetooth And Class 2 Laser) Socket Mobile Series 7 Cordless Hand Scanner (Class 1 Laser, Bluetooth V2.1, Hid, Spp) Socket Mobile Series 7 Cordless Hand Scanner 7Ci, Apple IOS, V3, 20 Bulk Pack (1D Linear Imager, Bluetooth V2.1, Hid, Spp) Socket Mobile Series 7 Cordless Hand Scanner V3 (7Xrx, Spp, Antimicrobial) (20 Bulk) Socket Mobile Series 7 Cordless Hand Scanner V3 (Class 1 Laser, Bluetooth, 7E V3, V2.1, Hid, Spp) (20 Bulk) Socket Mobile Series 7 Durable Case, Apple IOS/Android, V3 (1D Linear Imager, Bluetooth V2.1, Hid, Spp) Socket Mobile Series 7 Durable Case, Apple Ios/Android, 2D Imager, Bluetooth, Hid, Spp. Comes With Lanyard/Belt Clip With Tether, Charger, Rechargeable Battery, And Cd With Documentation And Software. Socket Mobile Series 7 Durable Case, Apple Ios/Android, V3 (1D Laser, Bluetooth V2.1, Hid, Spp) Socket Mobile Series 7 Series 7 Cordless Hand Scanner (20-Pack, Chs 7El, Bluetooth, Cl1 Laser) - Color: Gray Socket Mobile Series 7 Series 7 Cordless Hand Scanner (Chs 7E2 V2, Bluetooth And Class 1 Laser) - Color: Yellow Socket Mobile Series 7 Series 7 Cordless Hand Scanner (Chs 7E2, Bluetooth And Class 1 Laser) - Color: Gray Socket Mobile Series 7 Series 7 Cordless Hand Scanner (Chs 7M V2, Class 1 Laser And Power Supply) - Color: Yellow Socket Mobile Series 7 Series 7 Cordless Hand Scanner (Chs 7P V2, Class 2 Laser And Rugged) Socket Mobile Series 7 Series 7 Cordless Hand Scanner (Chs 7X, Bluetooth, 2D Standard) Socket Mobile Series 7 Series 7Rx Cordless Hand Scanner (Chs 7Nrx V2 And Class 1 Laser) Socket Mobile Series 7 Series 7Rx Cordless Hand Scanner (Chs 7Xrx, Bluetooth, 2D Scanner And Antimicrobial) Socket Mobile Series 7 Socket Cordless Hand Scanner 7M,Standard Case, Apple Ios/Android, V3 (1D Laser, Bluetooth V2.1, Hid, Spp) Socket Mobile Series 7 Socket Cordless Hand Scanner 7Xi Durable Case, Apple Ios/Android, 2D Imager, Bluetooth, Hid, Spp. Comes With Lanyard/Belt Clip With Tether, Charger, Rechargeable Battery, And Cd With Documentation And Software Socket Mobile Series 7 V3, 1D Linear, Bluetooth V2.1, Hid, Spp (20 Bulk) Socketcare 1 Year Extension CF Scan Card, SC Plus Pgrm Reqd Socketcare 1 Year Extension Somo Socketcare Plus Prgm Required Socketcare 1yr Extension For Chs (Plus Program Req.) Socketcare Comprehensive CF Scancard 4,5,6.Sc Plus Pgm Req Socketcare Comprehensive-CHS Cordless Hand Scanners Socketcare Comprehensive-Somo Socketcare Plus Prgm Required Socketcare Plus 2 Year For Cordless Hand Scanners (CHS) Socketcare Plus-2 Year CF Scan Card 4,5,6 Series Socketcare Plus-2 Year For Somo Socketcare Plus-3 Year CF Scan Card 4,5,6 Series Socketcare Plus-3 Year For Somo Standard Lithium-Ion Battery Provides Excellent Battery Performance For Long-Lasting Scanning Performance And And Standby Time. Standard Lithium-Ion Battery Provides Excellent Battery Performance For Long-Lasting Scanning Performance And And Standby Time.